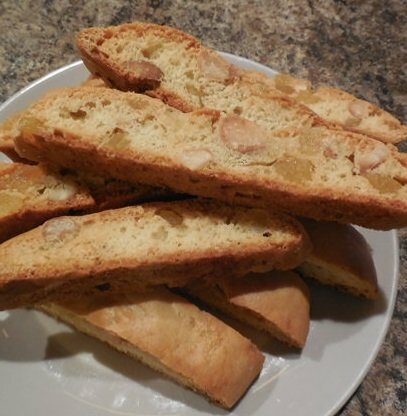 These Gluten Free Biscotti Toscani are crisp and crunchy, predominately almond flavored with a hint of orange from the added zest. 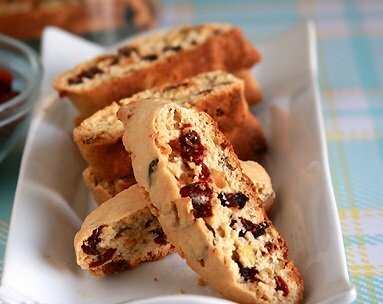 I was first introduced to Biscotti Toscani when I went to a baking class. 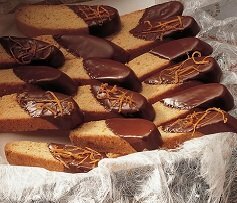 It is considered to be a traditional recipe, the ingredients were pretty basic and it did not contain any butter or oil. This recipe is not quite as simple because it is gluten free, which requires different flours and additional ingredients to obtain a similar texture and flavor. It also contains some butter to help the flours bind better. 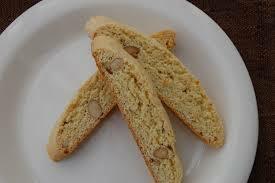 The most distinguishing feature of these biscotti are the chunks of almonds. To intensify the almond flavor it has a little pure almond extract added. These twice baked cookies have a delicate flavor, great with vanilla ice-cream, tea, frozen yogurt, or cappuccino. Cover baking sheet with parchment paper or grease and flour baking sheet. In a large bowl cream butter and sugar until light and fluffy. Add eggs, extracts, and orange zest and blend in. In another bowl combine flours together and whisk till mixed. Slowly blend dry ingredients into creamed mixture. Stir in almonds. Add a little water if dough is too dry. Consistency should be similar to play dough. After mixing, scrape the dough out onto a lightly floured work surface and BRIEFLY knead. Cut in half and roll half of mixture into a log approximately 12 inches long. Place on baking sheet and smooth into loaf about 1/2 thick and still 12 inches long. Repeat with other half of mixture side by side on same baking sheet. Cool completely and store in tightly covered container.